We tend to think of ourselves as having so much more environmental awareness in terms of the impact we have on the natural world these days and, similarly, the way the environment positively or negatively impacts our health and wellbeing too. But, when it comes awareness of how the environment we create within our homes impacts us either positively or negatively, this can feel secondary (or even less than that) in terms of importance on our wellbeing awareness radar. …and their guide provides advice for the ways we can consider and improve these factors to benefit our sleep. It’s also interesting to note in this article that the Sleep Council indicates ‘Your bed is by far the most significant element of a good night’s rest’. 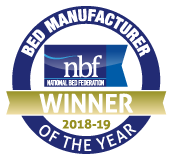 So take their advice and be more aware about the environment you create for your sleep and never underestimate the significance of a good quality bed in maintaining good quality sleep.